Summary: Wedding Dogs captures man’s best friend at 75 weddings—dogs as the best man, maid of honor, ring bearer, or another member of the wedding party! Decked out in little doggy tuxedos or sporting a wreath of roses around their necks, these pooches share in the wedding couple’s big day. I am not exactly what you'd call a huge dog lover! I like dogs well enough and I am always one of the first to fuss over a puppy, but I haven't had a dog since I was a kid; and we aren't really a family who would ever consider having a dog. Of course, I tell everyone that it's because my son and I are allergic to them, but in all honestly, I think I'm just not the type to deal with dog hair and other doggy things. 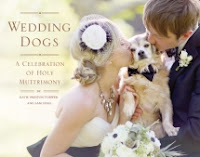 So it might come as a bit of a surprise that when I was offered the chance to take a look at WEDDING DOGS: A CELEBRATION OF HOLY MUTRIMONY by Kate Preston Toeffer and Sam Stall, I jumped at the chance. The idea of an entire book of couples who included their dogs as part of their wedding ceremonies made me grin. I just had to check it out! Now I'm the first to admit that WEDDING DOGS will not appeal to everyone. In fact, I'm pretty sure that there's a big percentage of people out there (including my husband and grandparents) who would say that the premise of this entire book is crazy. However, there are also a huge amount of dog lovers out there who would totally "get" it. In fact, the New York Times reported that close to 5% of brides include a pet in their wedding party. That number probably doesn't even count those who do pre-wedding photos with their furry friends. I thought WEDDING DOGS was cute and sweet, and I can certainly see the appeal for dog lovers. This book would be perfect sitting out on a coffee table because the color photographs were absolutely gorgeous. In addition, there are short essays about the couple's wedding day and the role their dog had in the festivities. I admit that I was a sucker for all of the photos of the brides and grooms and especially their dogs, and I had to smile at the various ways the doggies were dressed for the wedding. The little tuxes, bow ties, boutonnieres, etc. were just precious! And don't even get me started on some of their expressions -- too cute! WEDDING DOGS is certain to be a hit with the dog lovers in your life. It's also the perfect gift for showers and weddings! One of our nephews and his wife had their dog at their wedding reception (not at the church though). This looks great! I too love looking at wedding pictures, and dog pictures, so it's a perfect combo! I'm getting ready to start this book today. It looks like a gorgeous book!